Breakfast smoothies are perfect on the go option for busy mornings. Just toss all ingredients in the blender and blend! 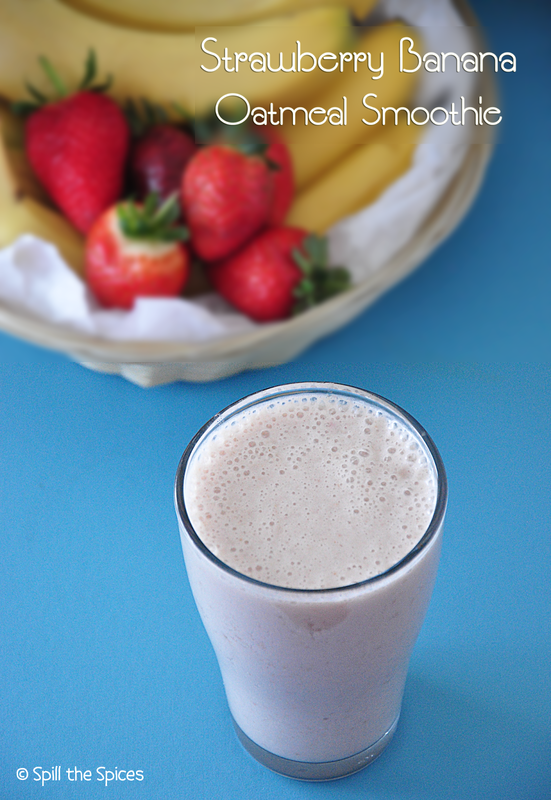 A filling smoothie makes a healthy start to the day and keeps you going all morning. Also smoothies are so versatile, just by varying the ingredients, you can enjoy a different flavored smoothie each day and you will never get bored. Now if you are a regular follower on my blog, you can see I have posted a variety of breakfast smoothie recipes. Recently I have started including oats in my smoothies and am absolutely loving it. 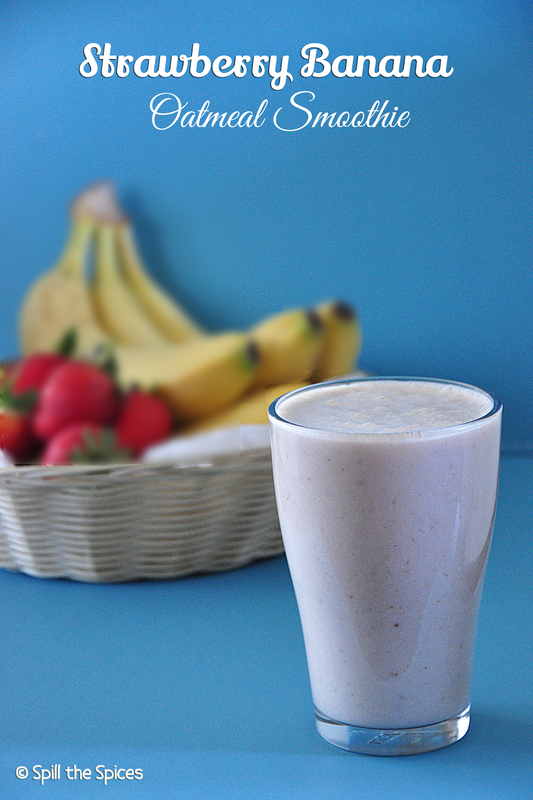 If you are trying to lose weight or looking for a post work-out light meal, oatmeal smoothies are a great option. I recommend old fashioned rolled oats over instant or quick oats as they are less processed and better. 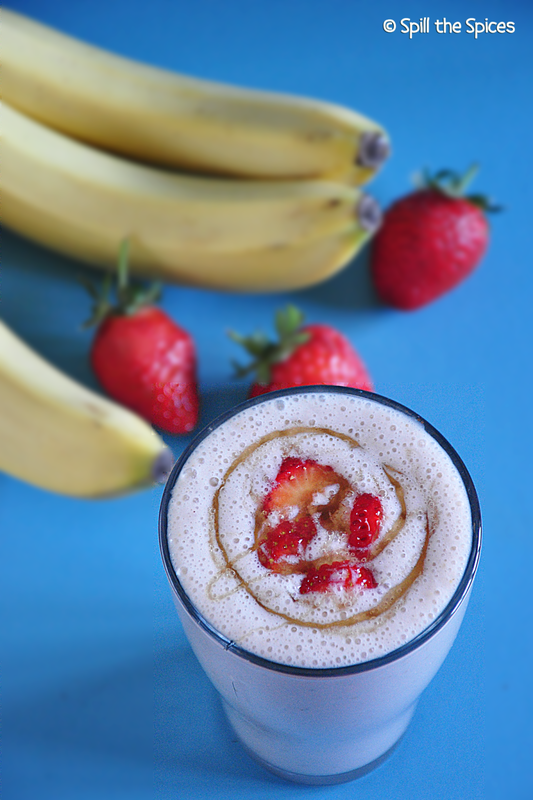 The goodness of strawberries and banana makes this oatmeal smoothie even more nutritious! 1. Toast the oats on low flame for a minute. Set aside to cool. 2. Blend the oats, almond essence and ½ cup milk in a blender until well combined. 3. Then add strawberries, chopped banana, honey, remaining milk and blend until smooth. Toasting the oats is optional, you can skip it. You can use vanilla essence instead of almond essence. If you prefer a smooth smoothie, powder the oats and blend with rest of ingredients. very healthy drink.. Nice one dear. This looks and tastes nice. A real filling health drink. In for smoothies anytime .Love it. I can happily start my day with this healthy and super filling smoothie..
Neat clicks.. Perfect after workout..
A very healthy, nutrient rich and delicious smoothie.. Loved the clicks, just beautiful.. Loved those clicks. Absolutely stunning styling! Looks delicious! Neat clicks and a healthy smoothie.